Tobe has been actively working in the entertainment industry for the last 30 years. He began his professional career as a child actor performing in feature films, television and theater. He is most well known for playing Teenage Freddy Krueger in the wildly popular horror franchise, FREDDY’S DEAD: THE FINAL NIGHTMARE. In 1991, Tobe received a BFA in Theater (Acting/Directing) from the prestigious, and highly competitive, California Institute of the Arts (Cal-Arts), where he received a full scholarship and fulfilled a transfer fellowship with the Royal Scottish Academy of Music and Drama (RSAMDA). His love for the legit stage has led him to produce 16 plays and direct 12 regionally as well as performing nationally in 97 fully mounted plays & musicals and thousands of performances. Tobe has won various awards including; Drama Log, Backstage West, Ovation, and Lester Horton Awards. He has worked with such notables as Mel Brooks, Kenneth Branagh, Patrick Stewart, Ed Sherin, Jane Alexander, Kenny Ortega, Richard Brander, Jack Klugman, Alexander Mackendrick, Peter Sellers, the Apogee Magic SFX team (STAR WARS), Academy Award Winner Mark Andrews (BRAVE) and VFX wizard, Stuart Maschwitz (SIN CITY, IRON MAN) to name a few. He also has the privilege of being a company member of several of the top theatre and dance companies in the world. As a Teacher & Coach, Tobe has organized and taught classes, seminars and workshops around the country. In the Los Angeles area, he had the honor to work with kids & adults at the esteemed Richard Brander Acting Studio and at the illustrious Will Geer Theatricum Botanicum. He has also taught movement, voice and fencing/stage combat at Sword-Play & the West Side Fencing Center. Most notably, he coached Golden Globe & Academy Award Nominee Djimon Hounsou, as well as Emmy & People's Choice Award Nominee Jenny McCarthy. As a Producer, his commitment to excellence in the cinematic arts and his love affair with new technology, over the last 15 years has allowed him become one of the most sought after underground movie producers in Hollywood. Tobe has received 30 awards from various film-festivals around the world and was recently the recipient of the prestigious Accolade Award of Excellence. By learning all aspects of production, as well as building deep relationships with some of the world’s top agencies, managers and craftspeople, Tobe has garnered notice by producing high-quality low-budget independent features. He has worked with Sony Pictures, Columbia Tri-Star, Mandalay Pictures, MTV networks, and Showtime Networks. Here is a list of a few people he's hired & worked with: John Savage, Maria Conchita Alonzo, Ving Rhames, George Takei, Christopher Atkins, Bruce Weitz, Colm Meaney, Mya, Corey Feldman, Bruce Boxleitner, Zach Galligan, Mindy Cohn, Bret Michaels, John Doe, Don E. FauntLeRoy, Aaron Platt, Zalman King, Costas Mandylor, Olivia Hussey, Giancarlo Esposito, John Gries, Richard Lewis, & Sally Kellerman. As well as Casting Directors such as Johanna Ray, Bonnie Gillespie, MIchael Hothorn, Valerie McCffrey. 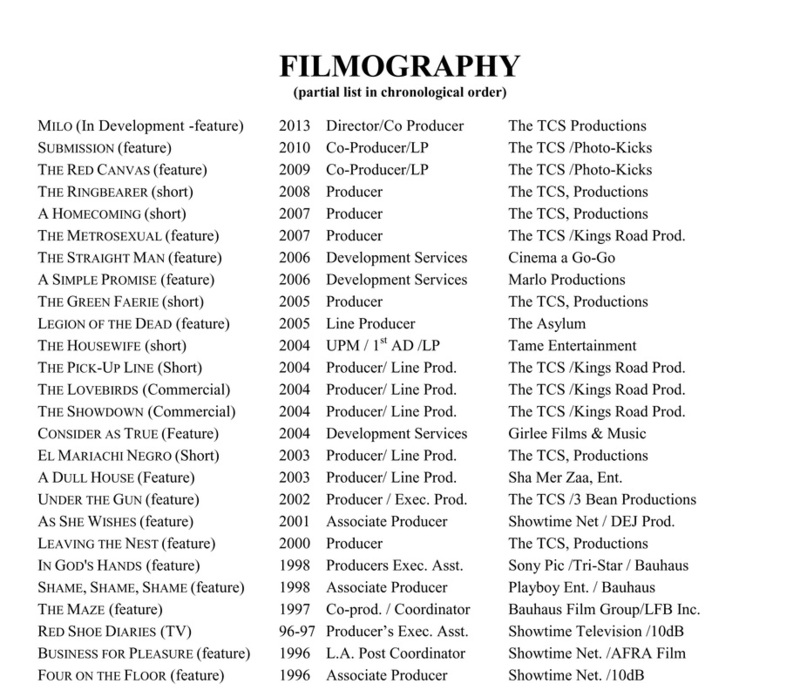 His experiences have culminated into over one hundred productions, thousands of performances, 18 feature films, 2 seasons on a Showtime Network television show, many short form projects, 6 national & 16 regional commercial spots and numerous voice-overs. By learning all aspects of production, he has had the unique opportunity to build deep relationships with some of the world’s top agencies, managers, casting directors and craftspeople. Tobe is ready to share his knowledge and experience of the craft of acting, in all its forms. Welcome to The Actors' Colony.